There's something nice about a work that alludes to its architectural environment, integrating with a room's features in some appropriate or ironic way - and in Radamés 'Juni' Figueroa's main installation at Edel Assanti, both qualities are in evidence. Beneath the gallery's skylight, the young Puerto Ricanartist has built a kind of sun platform or skydeck: a stepped, three-tiered structure madefrom untreated plywood, the top level of which sits just below the surrounding panes. There are arcing palm trees in pots dotted about the platforms, some tumbling spider-plants hanging from the skylight's bracing and a commanding view of the rest of the show below. The whole thing would all be rather pleasantwere it not for the fact that, on a warm London afternoon and after the exertions of scrambling up the structure, it's actually unbearably hot and muggy up there. To be sure, such sensations of stultifying heat and closeness are entirely appropriate. Figueroa gives most of his smaller works the title Tropical Readymade (all works here 2015) – the idea being one of transplanting everyday Puerto Rican objects, of representing the island’s environment and social norms. In one such series here, a triptych of footballs and basket- balls – recalling Jeff Koons perhaps – have been cut open and converted into makeshift, greenery-filled planters: a reference, perhaps, to the tiny nation’s defining contrast of jungleand beach, its almost overwhelming fecundity. And in another series opposite, the evocation of adaptive, beach-bum lifestyles is even more literal, the works consisting of cheap plastic slatted blinds draped with shorts, T-shirts and other bright clothes, as if hung out to dry in the blistering sun. Of course, it’s difficult to view any of this as hugely original. 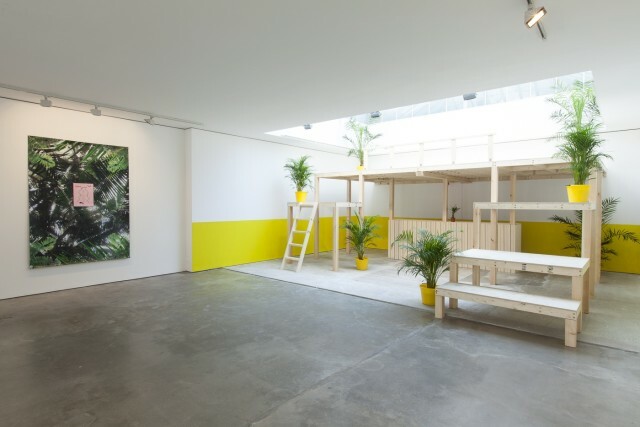 The use of potted palms as a motif, the references to vernacular architecture, the participatory aspect of the sun platforms (also used for occasional performances and events during the course of the exhibition) – all of this can’t help but bring to mind the work of Hélio Oiticica. Figueroa has acknowledged the influence of Oiticica’s ideas, yet the fact that there are quite so many echoes of the Brazilian’s Tropicália philosophy still feels rather jarring. What saves Figueroa’s work from being an out-and-out rehash is, I think, the greater allowance he makes for layers of irony, for different aesthetic registers becoming jumbled and confused. Although this is a pretty pared- down show in a small space, the best moments are those that evince a sense of exuberance, a kind of kitsch richness. It’s there in the melange of patterns on the hanging clothes: not just the tropical clichés of pineapple or palm-tree designs, but also a pair of Munch Scream socks – the idea being, perhaps, that art is something that feeds off popular culture, like Figueroa’s appropriations, but also feeds back in, in a process of constant looping and folding in upon itself. And there’s a similar layered complexity to a final, uniquely titled piece. I Dream with Snakes consists of a small bright outline painting – bearing the vaguely heraldic device of twinned snakes and a sword, and the motto ‘dreams become true’ – placed atop a huge vinyl print of dense jungle foliage. The dream imagery (assuming that’s what the canvas depicts) is clearly personal, its meaning oblique; yet at the same time it’s derivative, based on commonplace forms and stereotypes. Ultimately, it’s this febrile sense of overlap, this melding of fiction and reality, that Figueroa would do best to pursue, rather than his less provocative paeans to social practices.